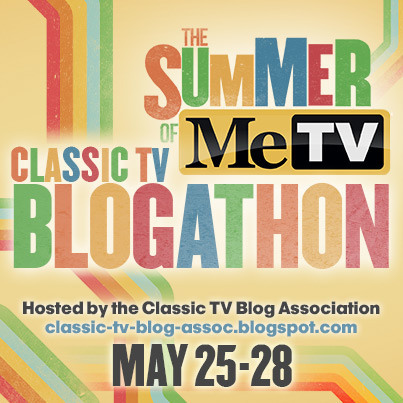 What connections can possibly exist between the sugary 1960s sitcom Family Affair and TV’s two creepiest anthology programs? Television actors made the rounds in the 1950s and 1960s, so perhaps its not surprising that both of Family Affair‘s lead actors and many of its recurring guest stars show up in these anthology shows. (It probably helped that both the Hitchcock show and Family Affair made good use of aging British actors.) It’s a treat, though, to see them in roles so different from the ones I spotlight each week in my Family Affair series. I’d originally planned this post for October 2, the broadcast anniversary for both Alfred Hitchcock Presents (which debuted in 1955) and The Twilight Zone (which aired its first episode four years later). I found so many interesting connections, however, that this post took longer to prepare than I’d anticipated. Its length also required breaking it into two parts. John Williams is the strongest link between Family Affair and the world of Alfred Hitchcock. Williams played Nigel French in nine first-season Family Affair episodes, while Sebastian Cabot recovered from an illness. His most famous career role, however, was Chief Inspector Hubbard in Hitchcock’s film Dial M for Murder. (He originated the role on Broadway and earned a Tony award for his performance.) 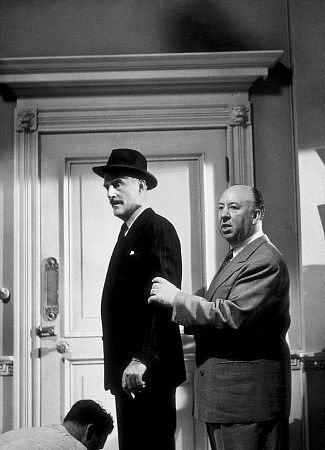 He also appeared in Hitchcock’s To Catch a Thief. 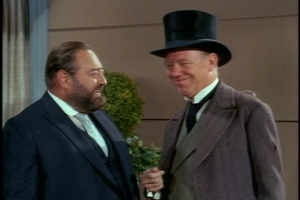 Williams was obviously a Hitchcock favorite–he would appear in no fewer than 10 episodes of Alfred Hitchcock Presents. The three-part episode “I Killed the Count” from Season 2 finds Williams in his most characteristic role as a stuffy Scotland Yard inspector. His character uncovers no shortage of suspects in a tangled murder case. The fun is in watching his exasperation build as “I killed the count” becomes an “I am Spartacus”-style refrain among people eager to confess. Parts two and three of “I Killed the Count” are also on Youtube and available through Netflix. In another second-season episode, “Wet Saturday,” criminals get the best of Williams. If you’ve ever longed to see Nigel French get slapped around, this is the episode for you. Also interesting is the happy epilogue that Hitchcock tacked on in his closing comments, to counteract the downbeat on-screen ending. Williams also made one appearance on The Twilight Zone, in an hour-long episode called “The Bard.” This isn’t a great episode; it strives too hard for hipness as it satirizes TV hackery. Williams’ turn as William Shakespeare is amusing, though. Who else could imbue the words Cat on a Hot Tin Roof with so much contempt merely by enunciating each consonant deliberately? The rest of the cast provides plenty of interest, too. It includes future movie star Burt Reynolds and future Dyna Girl Judy Strangis. Brian Keith never appeared on The Twilight Zone, but he did appear on five episodes of Alfred Hitchcock Presents (including one after the show’s 1962 expansion and re-titling as The Alfred Hitchcock Hour). The most interesting for Family Affair fans is probably “Cell 227,” in which Keith portrays a condemned prisoner. The script is a bit preachy and lacks the typical Hitchcock atmosphere, though the ending provides a suitably grim “gotcha.” Keith gives his usual strong performance, and it’s a major departure from Uncle Bill. Liam Sullivan, who appeared in one Season Three episode of Family Affair, plays a priest here. Frank Nelson, an annoying neighbor in two memorable Family Affair episodes (“Mrs. Beasley, Where Are You?” and “Ballerina Buffy”), has a more sympathetic role as a lawyer fighting to save Keith’s character. Keith himself plays a crusading lawyer in “The Test.” His courtroom tactics are questionable, but there’s a method to his madness. This one has a thought-provoking, ambiguous ending. Sebastian Cabot appears in the first-season Twilight Zone episode “Nice Place to Visit.” As the spiritual guide of a recently deceased thug, he’s Giles-French-like throughout most of the episode. The ending twist, while predictable, shows him in a very different light. Cabot also appeared in one Alfred Hitchcock Presents episode, Season One’s “A Bullet for Baldwin.” He’s Baldwin, and the episode’s opening events suggest that Cabot’s appearance will be brief. As you might expect on this show, things are more complicated than they seem. Legendary actress and director Ida Lupino appeared as French’s old flame Maudie Marchwood in two Family Affair episodes. She appeared in one Twilight Zone episode, Season One’s “Sixteen-Millimeter Shrine.” The paranormal twist in this one comes too late to add much interest to the story of a fading actress living in the past. Lupino is always interesting, but this script doesn’t do her any favors; it reads like her character is 70, while Lupino was just over 40 when this aired! Alice Frost, who appeared in the memorable Family Affair episode “The Candy Striper,” also appears here and gets to do some good screaming. 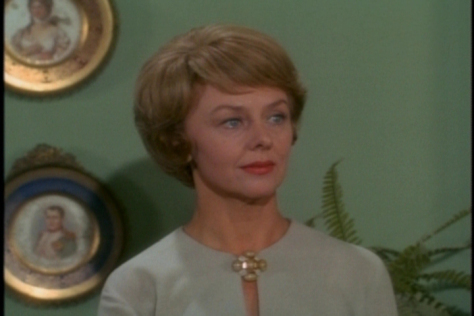 A first-season Family Affair guest star, Hartman appeared on three episodes of Alfred Hitchcock Presents. You remember him–he sold Buffy and Jody a broken down horse. The full episode doesn’t seem to be on Youtube, but you can watch it through Netflix or Amazon Prime Instant Video. Louise Latham launched her screen career in Hitchcock’s Marnie as the title character’s mother. 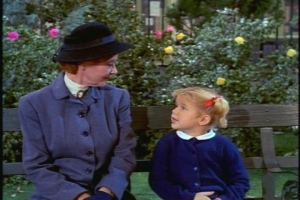 On Family Affair, of course, she was Aunt Fran–a character who cast a longer shadow than her three appearances would suggest. Another connection involving this episode: Stanley Cortez served as director of photography here, as well as on the first two episodes of Family Affair. A veteran cinematographer, Cortez had worked on such movies as The Magnificent Ambersons and Night of the Hunter. Surprisingly, Heather Angel never appeared on the Hitchcock series. She would have been well suited for various British dowager parts, and she did have small parts in two Hitchcock films, Suspicion and Lifeboat. On Family Affair, Angel played Miss Faversham in a whopping 18 episodes–many more than any other recurring cast member.